Since we are in the middle of summer, we can continue having fresh salads as lunch or dinner. This Tangy Green Bean Salad is one of the best ways to enjoy very fresh summer beans. We mostly cook green beans with tomatoes and a generous amount of extra virgin olive oil, which becomes a perfect vegetarian dish. But sometimes we want to have something chilled and this salad is a great choice for us then. The bean you use in this salad must be fresh, I don’t recommend using canned or frozen green beans for this recipe because you won’t get a good tasty result with them. Do you have any idea how you can understand if the green beans at the market are fresh enough? Just bend one or two and see if they snap easily. If yes, they are fresh. You shouldn’t buy them if they bend like a rubber band. You can even understand it from the crunchy noise they make when bended. We sometimes have this tangy green bean salad as a side dish too. It pairs wonderfully with Honey Sesame Chicken Wings or Cheese Stuffed Meatballs. What would you like to pair this salad with if you don’t prefer having it as a meal? You don’t need to cook the green beans very long since they are really fresh. Just 5 minutes will be enough for them to be cooked and crispy. If you want them to keep their vibrant green color, immediately transfer them into a bowl full of ice water. This will stop cooking and keep that crispiness. I added a little vinegar, but it wasn’t a good idea because it changes the color of the beans to yellowish, so just don’t use vinegar or add it after you coat the beans with oil as Elise suggests in her Green Bean Salad on Simply Recipes. Fresh green beans are blanched a little and coated with a tangy dressing. Add the green beans and onions. Blanch for about 5 minutes. The beans must still be crisp. Transfer the beans immediately into ice water and let them sit there for about 5 minutes. Drain well. Place the beans in a large bowl. Prepare the dressing by simply mixing everything and pour it over the beans. Combine the beans with the tangy dressing well using your hands. Chill for 30 minutes and serve with cherry tomatoes. Green bean salad with chili powder + lemon + olive oil. I’m going to check this recipe out once I go back. 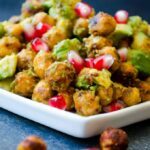 It sounds so easy and refreshing, and I can see we get quite addicted to this simple salad! Salad needs to happen around here this summer! This looks amazing!